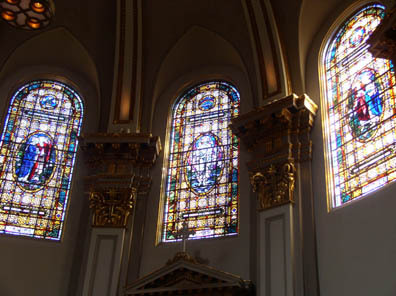 St. James Cathedral is filled with stained glass windows. Some of the windows tell stories. Some show images and symbols of the saints. All of them can teach us more about our faith! 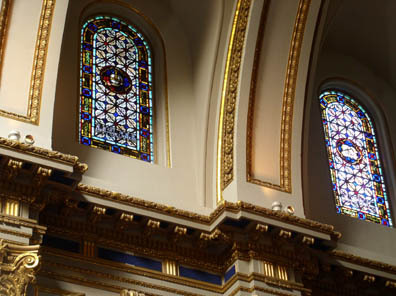 As you enter the Cathedral, high over your head, in what is called the clerestory, are windows that represent the ten commandments. These windows are symbolic: that is, they show us images which represent spiritual ideas. The next time you are in the Cathedral, see if you can find the window that shows two hands praying before the altar. This window represents the third commandment, which tells us to keep holy the Lord's day. When these windows were installed in 1918-19, the children of the Cathedral School saved up their money to pay for one of them. Their window shows a sceptre, a symbol of authority. Can you guess which commandment it represents? Highlight here for the answer: The fourth commandment, "Honor your father and your mother." On either side of the west aisle are six great saints. On your right as you enter is St. Patrick, patron saint of Ireland, crushing a snake under his foot. On your left is St. James the Greater, the patron of the Cathedral. 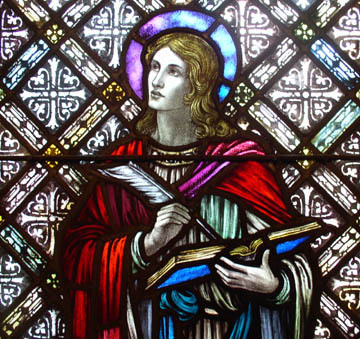 Then are the four evangelists: Matthew, Mark, Luke, and John (shown here). Click here to read more. In the south transept are three windows that tell the story of Jesus' resurrection from the dead. In the center is Jesus. He looks straight out at us, as he shows us his wounded hands. On either side of him are two angels, with pink wings! They are bowing their heads in adoration. The colors of the window tell us a lot about the story. They are glorious colors, gold and white, rosy pink, and green. At Jesus' feet, if you look closely you can see little flowers in almost every color of the rainbow! In the left hand windows, we see the holy women hurrying to the tomb. They are carrying ointments because they are planning to anoint the body of Jesus. They are just about to realize that he is not dead--he is alive! Soon the women find the tomb empty, and run to tell the apostles. In the right hand window, two of the apostles, Peter and John, are also running to the tomb. Everyone was in a hurry on Easter morning--they were eager to spread the good news. Jesus is not dead--he is risen as he said! Alleluia! In the East Apse, there are three windows. In the center is a window that represents baptism (see below!). On either side are two windows that tell the story of Jesus' passion, death and resurrection. In the window shown here, we see Jesus stripped of his garments. 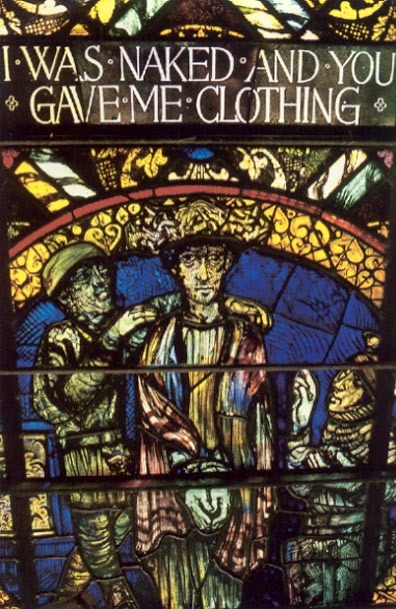 Above the roundel, we can read the words, "I was naked and you gave me clothing." Below it is another inscription that reads, "I was naked and you did not give me clothing." These words come from the 25th chapter of Matthew's gospel. There, Jesus tells us that whatever we do for the least of our brothers and sisters, we do for him. When we care for each other, we are really caring for Jesus. When we fail to be caring, Jesus suffers, too. The center window in the East Apse shows three different bible stories. At the bottom of the window, we see Noah in his ark. He is smiling as he reaches out to the dove that brings him an olive branch. When he sees the olive branch, Noah knows that the flood waters are subsiding, and soon they will be on dry land again. In the center of the window, we see Moses leading the chosen people through the Red Sea. He holds his staff high, with the water like two walls, on his right and on his left, as the people stream through. And at the top of the window, we see Jesus's baptism in the Jordan. 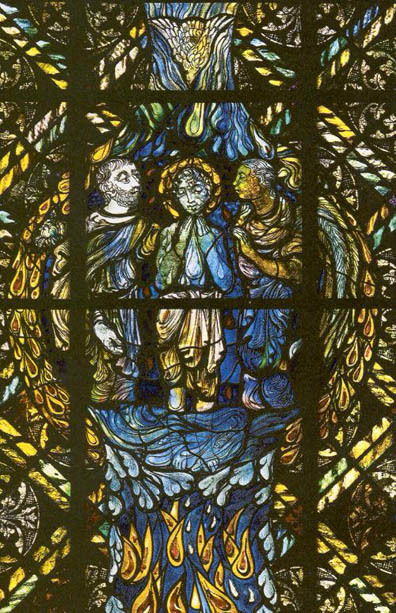 John the Baptist baptizes him while an angel looks on, and the Holy Spirit descends from heaven. What kind of expression does Jesus have in this window? What feeling do the colors and shapes of the window give to this scene? Almost every church has a sacristy, a place where the priest and ministers get ready for Mass. 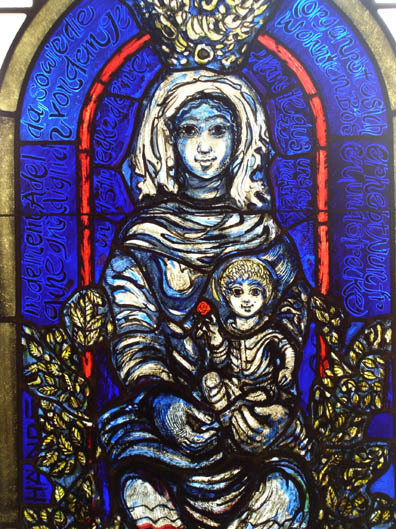 In the south sacristy of the Cathedral there is a beautiful window of Mary and Jesus. Mary wears a crown, and Jesus holds a bright red rose. Around them are the rich leaves of a flourishing plant. In the border, you can see the words of poem by Hildegard of Bingen. The poem is written in German, and is a prayer to Mary. How is this image of Mary and Jesus different from other images of the Mother and Child you have seen? How would you describe the expression on their faces? They are both looking straight at us. If they spoke, what do you think they might say?